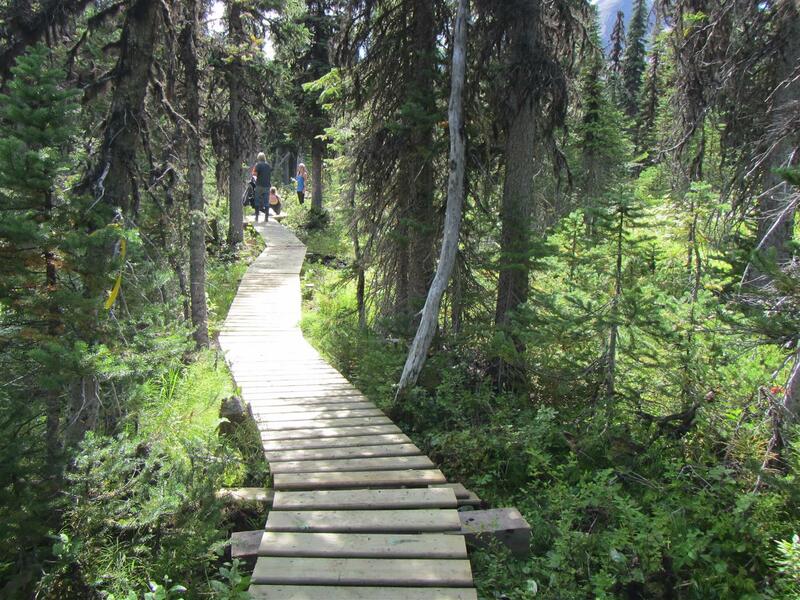 The five kilometre hiking trail to Windfall Lake was developed by Wolverine Nordic and Mountain Society (WNMS) volunteers in 2008. Since then it has become one of the most popular trails in the region, leading to superb mountain and lake scenery. Its intriguing geology and internationally significant fossil-bearing areas also make it a geosite of great importance in the Tumbler Ridge Global Geopark. About two kilometres into the trail there is a boggy meadow, which has become wetter and boggier with increasing foot traffic. In order to 1) protect the fragile meadow and 2) make life easier for hikers, a plan was developed by WNMS to board-walk this section of trail. A proposal to the Peace River Regional District in late 2014 was approved, and funding was allocated to the project. On August 15th it all came together. Thirty boardwalks (6-inch decking on 12-foot stringers) plus sixty 6-inch x 7-inch four-foot-long cedar boards for the ground layer were transported from town to near the trailhead by tow truck, flown in by helicopter, and installed within about six hours. The result is a durable 120 metre-long structure that blends in with the meadow. During the construction phase many hikers passed by, expressing a mix of bewilderment and appreciation. For anyone enjoying this enhancement to the trail system, it is difficult perhaps to comprehend the huge community effort and co-operation that go into making a project like this successful. The work party of ten volunteers continued the good work of many others from WNMS who had laboriously screwed in the decking to build each boardwalk section in town. Peace River Regional District provided $6,750 of funding, and the project expenses could be kept within this budget amount thanks to some remarkable industry support. Dean Turner at Ace Hardware cut the decking into 30 inch lengths as a donation. HD Mining donated the cedar 6 x 7s. Ridge Rotors and pilot Wilson Southam provided an outstanding non-profit rate and only charged for a minimum of flying time. Within seconds of hearing of the project Pernell Kirby of Southpaw Rentals & Sales Ltd. donated use of the tow-truck, and Bill Woods donated his time as tow-truck operator. Without such support, projects like this often simply don’t succeed, as they are exorbitant for non-profit groups. For each of the volunteers in the work party, helping to enhance the community, the trail system and the Geopark provided a most fulfilling way to spent a summer Saturday. 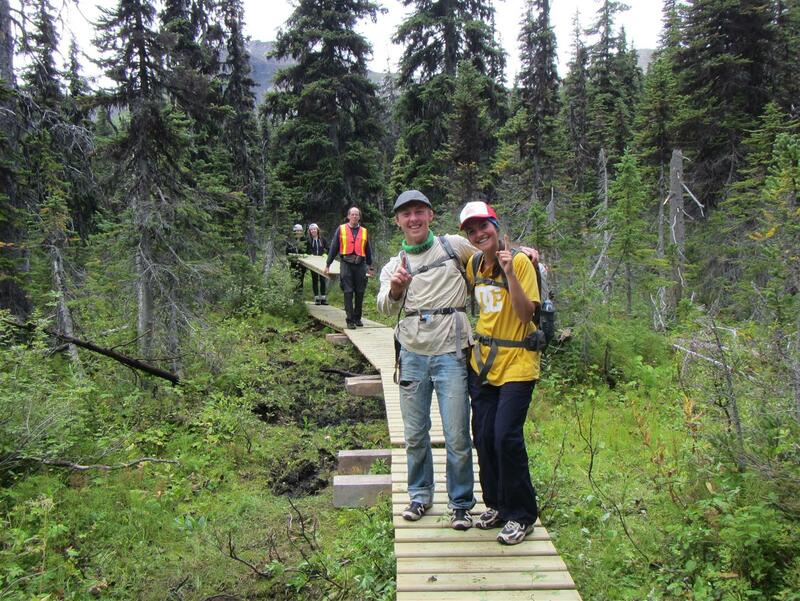 All in all a fine example of the volunteerism and community spirit for which Tumbler Ridge is justly renowned. 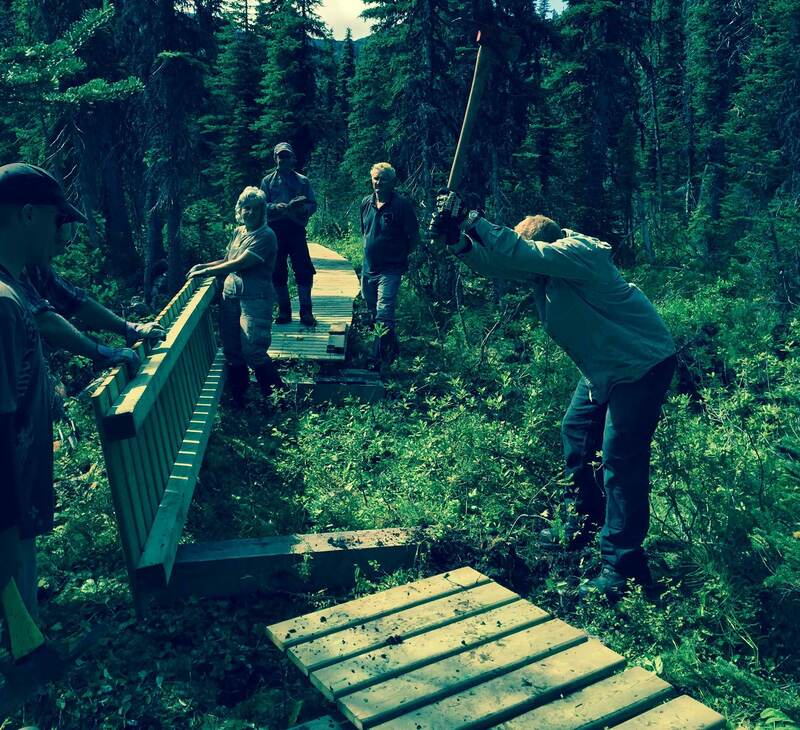 This last weekend the WNMS installed stairs and other trail improvements on Windfall Lake.